Confidence, or self-esteem, is a mental state that can affect every layer of our lives. The state of your self-esteem can affect personal and professional relationships, successes and mental health. “Self-esteem is one’s confidence in the ability to navigate and cope with life’s challenges and the confidence that one is worthy of love, accomplishment, success, joy and happiness,” says Dr. Crystal Frazier, psychologist at UT Health East Texas. The importance of self-esteem is significant, which is why sources of bad self-esteem should be identified and eliminated from your life. 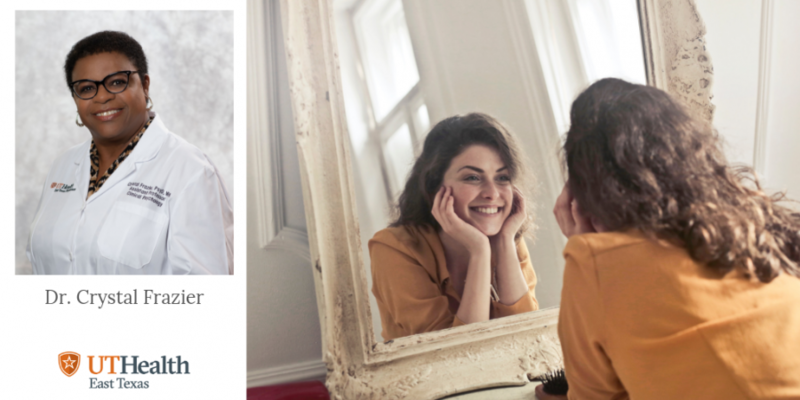 Dr. Frazier shares information on the effects of self-esteem and how to make positive changes to give it a lasting boost. Low self-esteem can impact personal, social and professional functioning and reduce overall quality of life. When experiencing low self-esteem, one may shy away from challenging situations, avoid social situations and stop trying new things. Avoidance can be protective in the short term; however, this avoidance serves to reinforce self-doubt and unhealthy coping. Living with low self-esteem long term can impact mental health and lead to problems such as anxiety and depression. Individuals with low self-esteem may develop unhealthy behaviors such as smoking and drinking as another way to cope with low confidence, fear and self-doubt. Low self-esteem often begins during childhood and results from hearing or interpreting messages from significant people including parents, siblings, friends and teachers, who were often very critical. This type of feedback results in thoughts such as “I’m not good enough,” “I’m not loveable,” or feeling as if they are unable to live up to others or their own expectations. Other causes throughout the lifespan include poor or abusive treatment from a partner or parent. A stressful life event (loss of a loved one, financial problems, unemployment), chronic medical or mental health illnesses and disabilities can also lessen our view of ourselves. Consistently setting unachievable high standards for one’s self can impact level of self-esteem, too. There are many factors impacting self-esteem or one’s confidence. If you have a negative opinion of yourself or engage in self-criticism, self-doubt and are uncertain whether you are deserving of happiness, the way you engage in life in general will be impacted. Do I participate in engaging social activities? Am I consistent in my fitness routine? Is my diet helping or hurting my mood and overall wellbeing? Do I spend too much time on social media? Chronic low self-esteem can be debilitating and demoralizing, possibly leading to mental health concerns such as depression and anxiety. If you are experiencing significant impairment in social, occupational, or other areas of your life, you may want to seek assistance from a mental health professional. However, there are my many self-help actions you can take to increase your self-esteem. Finding and enjoying what you’re good at can elevate your mood and increase positive thinking. Surround yourself with people who are positive, and distance yourself from people who tend to lower your mood or who themselves engage in negative thoughts or comments. Challenge yourself by setting a realistic goal, and once achieved, recognize and write down thoughts and feelings associated with your accomplishment. Success helps to increase self-esteem. Practice being assertive. Challenge yourself to express wants, desires, thoughts and opinions. Initially, you may feel emotionally uncomfortable. Afterward write down and reflect on thoughts and feelings. Focus on the positive. Read and write positive messages daily. Browse inspirational and self-help sites, or find self-help guides you identify with. Challenge negative self-talk. For example, one may write “I’m not lovable.” Disproving this thought can include writing down who calls or visits regularly such as a parent, child, or friend or writing down good things people say about you. Stop comparing yourself to others. Accept that everyone is different, and your life has as much value as others. At times, we all experience reduced confidence and do not have the best opinion of ourselves. But chronic low confidence/self-esteem can be destructive, lead to mental health concerns and reduce quality of life. The good news is self-esteem is not static and can be changed with consistent effort. Increasing self-esteem takes time and practice, so the more frequently you engage in the tips listed above or more formal assistance when needed, the more likely you are to build and sustain improvements in self-confidence. UT Health East Texas can assist you with increasing self-esteem and with treating commonly associated mental health problems such as depression and anxiety. Our team of licensed mental health providers including psychiatrists, psychologists, clinical social workers, counselors and other trained staff, are dedicated to providing comprehensive and compassionate mental health care. Treatment can be pharmacologic, or talk-based using cognitive behavioral therapy (CBT). CBT is effective for treating characteristics associated with low-self-esteem including excessive self-criticism, fear, self-doubt, low assertiveness, and a sense of being unworthy. For more information about the mental health services available at UT Health East Texas, please visit our website at https://uthealtheasttexas.com/. Dr. Crystal Frazier is a doctoral level trained Licensed Psychologist with extensive education in clinical psychology. She is an assistant professor in the Department of Psychiatry and Behavioral Medicine and a member of the doctoral psychology internship program training committee. 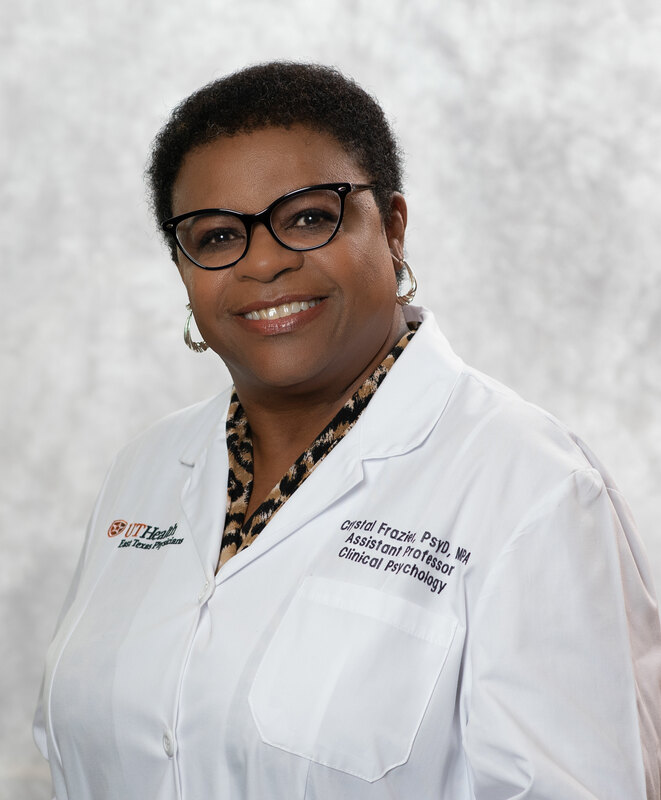 Dr. Frazier has managed her own psychological services practice where she provided care to older adolescents, and adults. She has a special interest in caring for patients struggling with anxiety, depression, and trauma related symptoms. She is passionate about helping clients complete the often very challenging therapeutic work and helping them achieve their goals for positive life changes. Patients can see Dr. Frazier by appointment in our Adult Psychiatry Clinic at North Campus Tyler.